The Pentagon approved Israeli electronic warfare equipment for the F-35 stealth fighter jet, whose wings will be built by Israel. 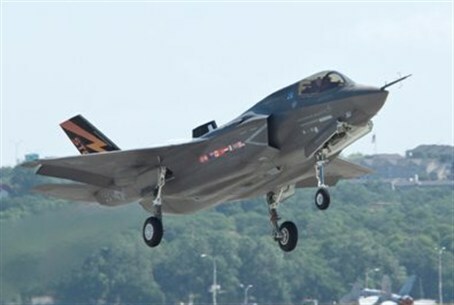 The Pentagon approved Israeli electronic warfare equipment for the F-35 stealth fighter jet, whose wings will be built by Israel Aerospace Industries (IAI), according to Reuters. Elbit Systems will supply advanced electronic equipment for the warplane. Israel wants to buy 19 F-35 jets, and the deal originally signed in 2010 includes options for up to 75 of the radar-evading fighters. Use of Israeli equipment on the planes has been a thorny issue, and the Pentagon agreement “kicks off the Israeli program,” a source told Reuters. The Pentagon reached an agreement with Lockheed Martin Corp. on a $450 million program to enhance electronic warfare equipment on the jet, and integrate Israeli-unique systems beginning in 2016. The F-35 will allow for even greater collaboration in the coming years with Israel, a critical strategic ally for the United States at a time when much of the Middle East is in turmoil. IAI already builds wings for the F-16 fighter jet, the world's most widely used fighter, also built by Lockheed. Elbit, in a joint venture with Rockwell Collins, makes the advanced helmet used by pilots on the single-seat F-35. In an unrelated project, Elbit was reported by Reuters Sunday as having won a contract valued at many tens of millions of dollars to supply a Latin American customer with a mixed fleet of Hermes 900 and Hermes 450 unmanned aircraft systems (UAS). The Hermes 450 UAS have been used extensively in defense forces worldwide, including in active war zones, and have accumulated over 300,000 operational flight hours. The Hermes 900 UAS offers enhanced capabilities, from higher flight altitude to longer endurance and heavier weight payloads.